President Vladimir Putin has signed to double Russia's nuclear energy by building 26 major new nuclear power plants. Also, Russia plans to export more than 60 nuclear plants in the next 20 years. The Kremlin has ordered ambitious nuclear expansion plans to be rapidly implemented and this will include the construction of the world's first floating nuclear power plant. Although some critics of the scheme claim that some of the plants that are going to be built, will use uranium enriched to almost weapons-grade level will cause a proliferation risk, there seems to be no stopping the Kremlin on this one. This expansion is happening partly due to a shift in public opinion, the threat of global warming, and increasing economic pressures. Currently about 15 percent of Russia's electricity comes from nuclear power but President Putin wants to increase that to 25 percent or more by 2030. 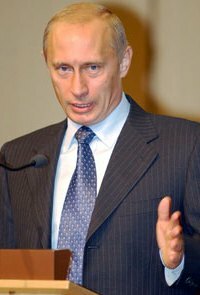 To cope with this new wave of plants, the Russian government recently ordered over thirty nuclear related companies to merge together into a single state owned entity, that will have total control of every aspect of the nuclear industry, from uranium mining to the decommissioning of reactors. This Russian nuclear giant, is going to be called Atomenergoprom (Atomic Energy Industry Complex), is similar to the other large conglomerates that the Putin administration has set up in sectors such as aircraft production, arms exports, electricity, and gas. Gennady Pshakin, director of the independent Center for Non-Proliferation said that, "I hope Putin has taken steps to avoid a second Gazprom." Well in our humble opinion it looks as if Putin is trying to replicate Gazprom as best he can. By creating large state companies controlling vast amounts of resources the government has given themselves tremendous power, both domestically and perhaps more importantly in the international arena as well. The online newspaper Gazeta.ru, said that 70 percent of Russians say they're strongly against any atomic station in their own neighbourhood. Russia is a vast country and we are confident that somewhere in that mass of land will be an area that will be suitable for a nuclear power plant. One must bear in mind that to a small remote village, a nuclear power plant or two will literally and economically give the area an energy boost. We may even see towns or even small cities springing up from nowhere across Russia as nuclear power expands, as Magnitogorsk is did in the 1930's with the steel industry expanding. Currently, Russia is building more nuclear power plants abroad than any one else, constructing facilities in Iran, China, India, and Bulgaria. They are also in talks with many other developing countries about the possibility of building reactors. As for the floating reactors, Russian experts say the units have been offered to Persian Gulf states, where they could be used to run desalination plants, as well as to such countries as Indonesia, Algeria, Malaysia, and Argentina. This is probably one of the best political moves that Russia, or any other country has made so far this year. By embarking on a rapid nuclear expansion program, Russia is securing its supply of energy and therefore protecting economic growth. Similar moves have already begun in China and India as these three nations gradually emerge as the superpowers of the twenty first century. Although this plan is aggressive, it is likely that this is only the beginning and Russia will be building far more than 26 reactors in years to come. This transformation of the world's energy supply towards nuclear is pushing up the demand for uranium, not just today, but tomorrow and for the next 50 years or more. This will send uranium prices to extreme heights and drastically increase the value of our uranium stocks. That should kill off any hope that Russia will renew the megatons to megawatts program.